Hey gang, just wanted to share my thoughts and some pics from this year's Chicago Comic Con. 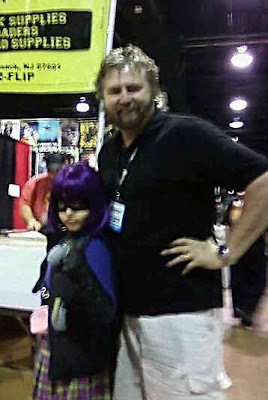 I had not did this event, (which has previously been known as Wizard World Chicago), since 2006. That year I was quite disappointed with the event, my sales and the lack of foot traffic...which probably explains why I stayed away so long. But this year's show was quite a different experience for me. There was significant foot traffic in the artist's alley area all 3 and 1/2 days of the event and Saturday's crowds reminded me of a day at Comic Con International (in San Diego) with isles so filled with people it was difficult just to try to move through the hall. In 2006, it seemed that the crowd was very indifferent to Eye Witness, which I basically determined by the few number of people that actually stopped to ask about it or grabbed a free poster. While during this year's show, it seemed many more people were interested in finding out just what the heck it was about, stopped to hear my pitch and gobbled up the free Unknown God Posters as fast as I could autograph them. And of course, when more people stop to take a look, that meant many more purchased. There were a number of "brother creators" were in the house this year also, which gave me an opportunity to refer people I knew were in search of comics and GN's with Christian or spiritual content, to their tables. There was Dr. "Solo" Perry of Honors Studios, with his War in Paradise comic...which. if you haven't seen it, is a beautifully rendered story of Angels and Demons which is reminiscent of the widely popular Archangels comics of the '90's. Got a chance to briefly meet Marc Moran, who shared with me his massive Conqueror and Conqueris graphic novel...can't wait to give it a read. I also got a chance to touch base briefly with the gang over at Kingdom Comics...who had a whole table of different faith based comic offerings. Also a big shout out to Martin Oakly and George Macas, who were also in attendence selling (literally) tons of comics they had just purchased! As with most major conventions this one was loaded with people in costumes. There was the requisite Joker in the Nurses uniform and Captain Jack Sparrow, groups of characters from the World of Batman and X-Men, as well as two guys who created home-made Iron Man and War Machine armor, that I would have sworn was the product of Marvel studios. But this was the only one I felt compelled to run out and get a picture of. This young girl was the perfect Hit-Girl! As with any of the Wizard promoted events this one had a real nice assortment of celebrity, movie and TV guests. But the biggest surprise along those lines was an appearance on Saturday morning by the newly convicted ex-governor of IL, Rod Blagojevich. He was there to sign autographs, have your picture taken with him and in general attempt to start building his new war chest for his second trial. Granted I did not leave my table to go see how many people actually gave this "character" their money, but when they announced his arrival most in the hall let out a thunderous boo! But as this picture here shows, even pro. 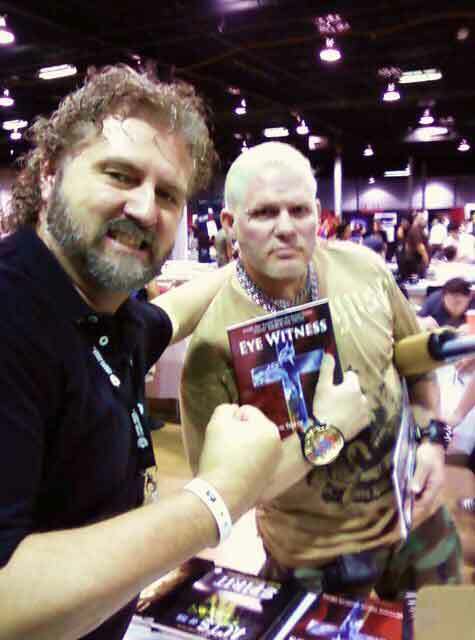 wrestlers enjoy the Eye Witness series! If you don't recognize him, this is the legendary, Raven, of the WWE, getting his copy of book one! Overall this was a very fine show for me...the best outside of the Creation NW music festival...in amount of sales. Now I'm really looking forward to the next Wizard sponsored shows I'll be doing in the fall leg of the Unknown God tour, in Boston, Austin and Atlanta! Hey gang, I couldn't resist speaking out on the absurdity of this story. I read in my morning paper that a media watchdog group, The Parent's Television Council, was organizing a boycott against any advertisers or local affiliates that would be supporting or airing the new CBS comedy, @#&& My Dad Says." The series, starring William Shatner, is based upon the widely popular twitter account of Justin Halpern of the same name, (which has also spawned a best selling book) and uses an actual profanity in it's title, rather than the symbols CBS is employing...which is a common practice in publishing/broadcasting to indicate profane language without using it. According to Halpern, "I'm 29. I live with my 74-year-old dad. He is awesome. I just write down @$%& that he says." According to PTC President, Tim Winter, "The title is indecent. Parents really do care about profanity when their kids are watching TV." Just so we are clear, the PTC is saying, "@#&$" (which is bleep, when spoken according to CBS), is indecent? Seriously?! Yes the original title does contain a profanity which is on the networks 7 words you can't say on Tv, but a bleep or symbols most certainly are not and never have been! Winter goes on to say, “CBS intentionally chose to insert an expletive into the actual name of a show and despite its claim that the word will be bleeped, it is just CBS’ latest demonstration of its contempt for families and the public. There are an infinite number of alternatives that CBS could have chosen but its desire to shock and offend is crystal clear in this decision,” said PTC President Tim Winter. I get the feeling the PTC must be kind of short on windmills to tilt at, (re: high profile issues...that aren't really issues....that fuel new fundraising efforts), because CBS did not insert "an expletive into the title," it inserted symbols that represent one...big difference folks! How thin skinned have we gotten as a culture if we now are offended not only by naughty words, but now by the terms or symbols that are commonly used to replace the offending words? This borders on the ridiculous, as it is tantamount to wanting to censor the idea, (I.E. that we must not allow people to watch a show that is based upon something that has a naughty word in it's title...even if the word is not used). The PTC is doing this under the banner of that they are protecting our children, but seriously, in this day and age of cable and satellite TV providing any number of non-network TV shows (and movies into our homes) which use the actual offending words, sexuality and acts of gratuitous violence, this seems a rather silly and trivial issue to stand behind. But like I inferred earlier, this feels more about publicity and fundraising...since they really can't do much to affect networks like HBO or Cinemax...and the over the air networks make a prime target to demonstrate how much organizations like this are needed and should be supported by concerned parents everywhere. When there are potentially dangerous ideas out there, we know the PTC will be there to make sure we can't hear, see or read about them. Carry on the good fight, gentlemen! I just got wind of Ann Rice's announcement concerning her Christian Faith over the weekend at my Church (The Village) during a talk by Matt Chandler about the reasons people use to insulate themselves from knowing God or embracing faith. Today I quit being a Christian. I’m out. I remain committed to Christ as always but not to being “Christian” or to being part of Christianity. It’s simply impossible for me to “belong” to this quarrelsome, hostile, disputatious, and deservedly infamous group. For ten years, I’ve tried. I’ve failed. I’m an outsider. My conscience will allow nothing else. … I’m out. In the name of Christ, I refuse to be anti-gay. I refuse to be anti-feminist. I refuse to be anti-artificial birth control. I refuse to be anti-Democrat. I refuse to be anti-secular humanism. I refuse to be anti-science. I refuse to be anti-life. In the name of …Christ, I quit Christianity and being Christian. Amen. This could be a very cleverly hatched promotional scheme to generate buzz for her upcoming book release (Of Love and Evil). And by association, it could also be part of a continuing attempt to recoup readers she lost during her "Christian" writing period (re: Christ the Lord: Out of Egypt) many of which who undoubtedly want the "Dark" Anne Back! Or this could also just be a modern American Christian (granted a very high profile one) venting about some of the very same issues that trouble many believers...that the faith has come full circle back to a religion that is not so different than Judaism during the time of Jesus and become the very essence of what he fought against. In other words, that with many "corporate Christians" it's become less about the Word, Jesus, salvation, forgiveness and compassion and more about the layer upon layer of "man-centered" rules and interpretations that have piled up over the centuries (Re: that to be Christian is to be conservative republican, to be against health care for all, to be against birth control etc...). During the time of the first century it was almost impossible to uphold all the rules man had piled on to Judaism, which is what Jesus came to strip away and why he was so despised by the religious leaders of the day. Just for the record, I don't share her beliefs on all the issues she lists, but understand and appreciate the spirit in which she is making this declaration. For almost 40 years I kept Christianity and Jesus at arm's length, due to the irresponsible, hypocritical and even criminal behavior of some of it's high profile members. How many others are not opening their hearts, minds and souls to the Word now, because of the exclusion they feel because they fall into one of many groups that the talking-Christian-heads they hear on TV say cannot join the club...when Jesus made it very clear that "all can join"! And of course he also told us, "all will not," but that is not for us to decide, but God. So bottom line, I feel like Anne Rice is really just venting and saying stuff some of us wish we had the courage or platform to give voice to...."Hey world, we are not exclusive, we are inclusive to anyone who wants salvation!" Notice she doesn't say she no longer believes, she's just saying she's sick and tired of the religious games. Saying so doesn't make us unworthy of our faith, just unsatisfied with how some men (and women, of course) have corrupted it.